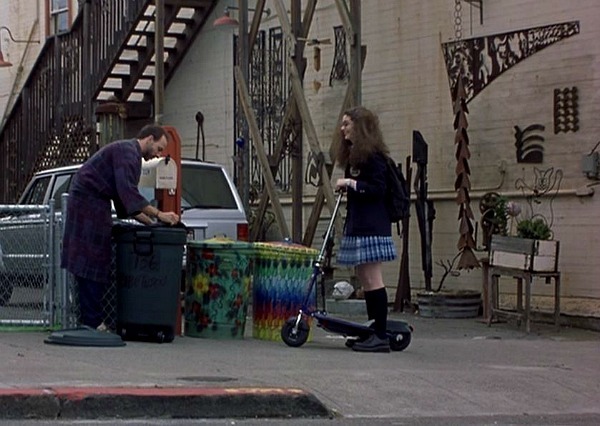 Have you seen The Princess Diaries lately? 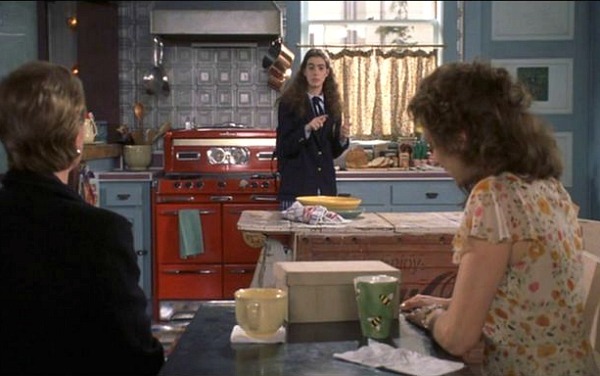 I just watched it again with my daughter, and not only was Anne Hathaway adorkable in her first movie role, but she and her mom lived in a way cool firehouse-turned-art studio in San Francisco. 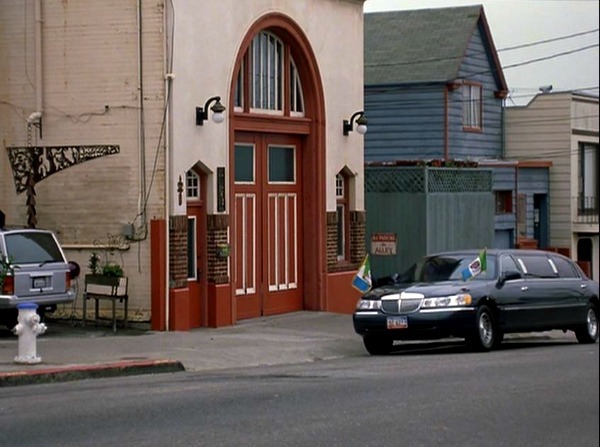 The Princess Diaries firehouse is on the market for $2.6 million, so let’s compare the real thing to how it looked onscreen! 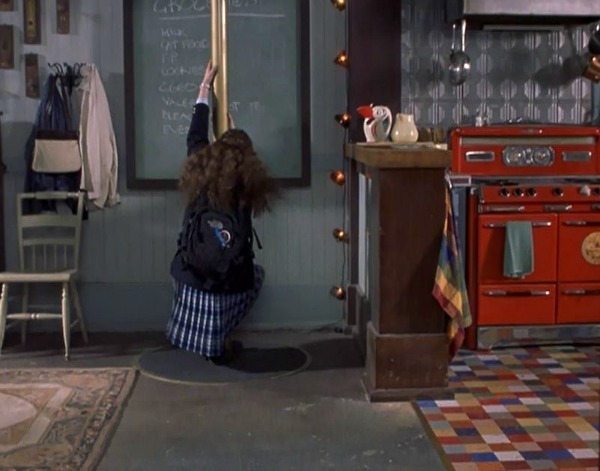 In case you never saw the movie or read the book series it was based on, The Princess Diaries is about an awkward 14-year-old girl named Mia Thermopolis, who is surprised to learn she’s a princess in the (fictional) country of Genovia. Mia’s mother is an artist, and the firehouse acts as her studio as well as their home. Note the framed chalkboard on the wall with a list of groceries on it. 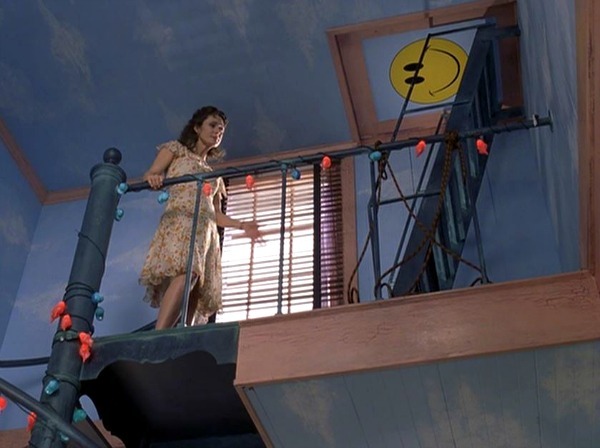 It’s connected to her bedroom below by a spiral staircase. 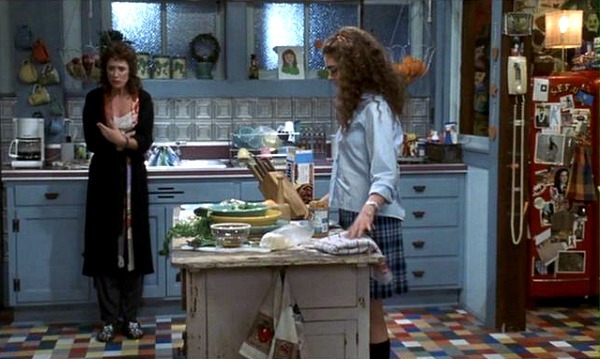 In the Princess Diaries book series written by Meg Cabot, Mia and her mother Helen live in a Greenwich Village loft instead of a firehouse. Instead of dying like he does in the movie, her dad actually comes to New York to tell her she’s a princess. In the movie, her grandmother delivers the news. 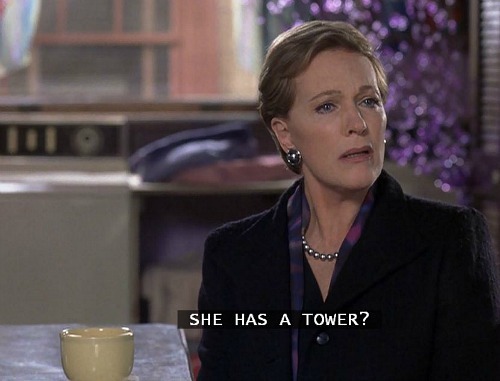 Who wouldn’t want to find out that Julie Andrews was their grandmother? Love her! It almost has the look of an art gallery in places, though. 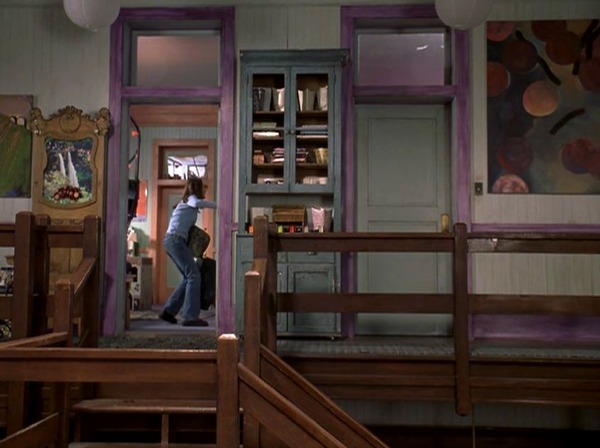 Would you rather live in the colorful movie version or the cleaned-up, blank-canvas of the real thing? For more photos and details about the Princess Diaries firehouse, check the listing, the article on Curbed, and Art Director Caty Maxey’s website. 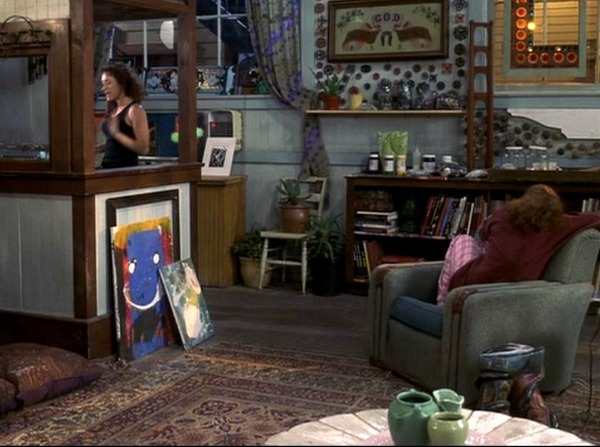 The firehouse sets in the movie make me itchy. Too. Much. Junk. Everywhere. No where to rest your eyes. The actual firehouse is so very white, but such a wonderful blank canvas. Agree! Just looking at the set photos makes my eyes bleed. Love the clean of the real place. This was an interesting post. I think I would prefer something between the frenetic, eclectic style of the movie set version and the blank slate of the real deal. 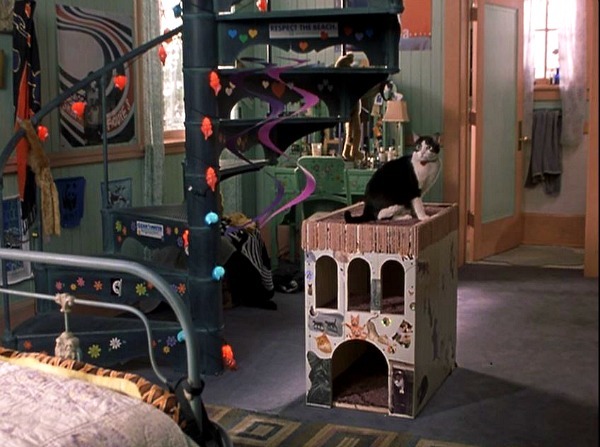 I did love some of the vintage touches from the set, such as the funky bed in Mia’s room. 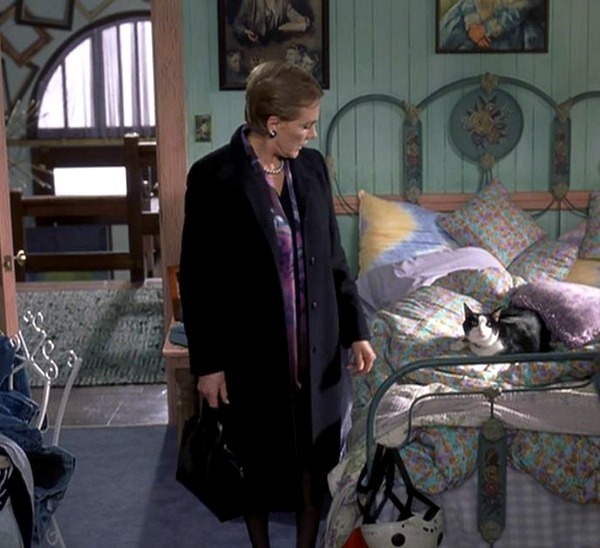 I thought Anne Hathaway and Julie Andrews were very believable as grandmother and granddaughter. Anne did a Mary Poppins spoof on SNL that is hilarious and really highlights the resemblance between Anne and Julie…..
That clip cracked me up. Thanks, Alie! Well, the movie version is fun, but I’ll take the more practical real-life space. I’d add a lot more color, furniture, rugs, etc. though. I never wanted to see that movie until I read this post – now I simply MUST see it, just to take in the house. 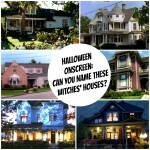 Love this movie and LOVE this house. Great post, thanks for sharing! 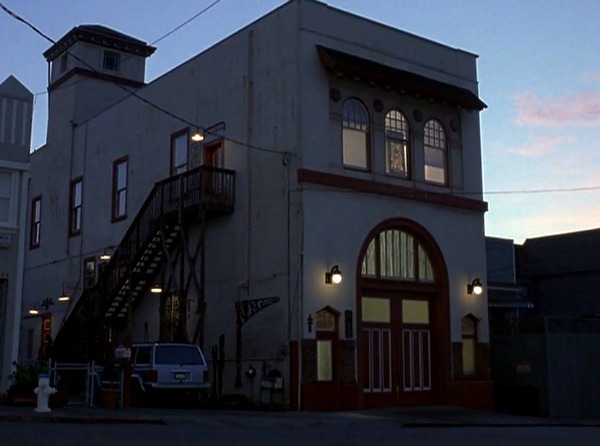 Absolutely love BOTH versions of the firehouse…in a weird split-personality sort of way. 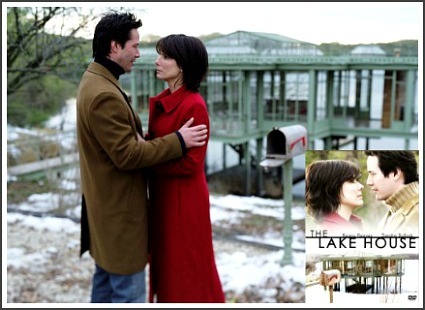 I love the energy of the movie version and the quietness of the real life version, but technically I wouldn’t choose to live in either because it looks like it is right smack dab in the city…and alas, I prefer the quiet of the countryside.Thanks for this post though, because now I want to read the books! Never knew there were any. 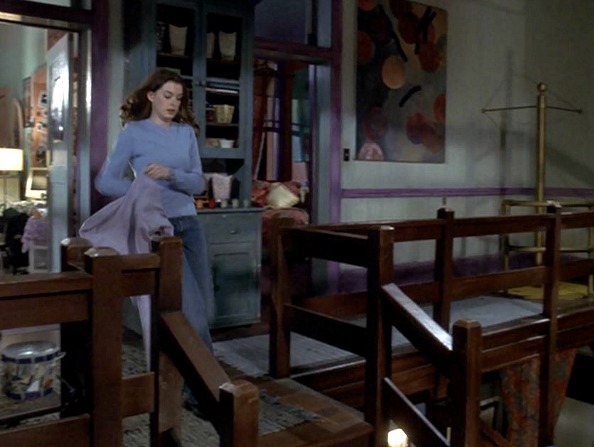 I love the open layout of the movie version, but the colors and clutter are just too much for me. Would be a blast to paint large crazy canvases in, but no relaxing vibe there at all. Speaking of painting 😉 the real life version is a blank canvas, in serious need of some color….and furniture. It looks too cold and uninviting as it stands now. Anne Hathaway was “adorkable” ??? Hee, hee! Loved the books! Loved Anne Hathaway and Julie Andrews in the movie, though it was pretty awful. But, I think I prefer the real firehouse. Really cool! I’ve seen the movie quite a few times. Being on the quirky, creative side I’d go for the movie set design over the blank white canvas. Correct me if I’m wrong, but I believe the same firehouse was used for the 1968 movie “The Love Bug” starring Dean Jones, Buddy Hackett, and Michele Lee. It was where the main character lived as well as the shop he worked on is little VW Beetle. Oh, really?! I didn’t know that, but now that you mention it, I definitely see the resemblance! I love the movie version so much better. I love a lot of stuff in a house, it makes it really homey. The real life version reminds me of a museum. I could never live in a house like that! The firehouse lowered its price by 375k yesterday. Agree! This was an interesting post when I came across this beautiful house.Oudoors brings a cool environment in your dwelling. What a completely charming space. It is incredible, thank you for all the time you put into researching and sharing your posts Julia.